So excited for this post today! It looks amazing! Have you entered the giveaway for the smilebooks photobooks giveaway??? Hello, my name is Sarah from The Ease of Freeze. You can usually find me blogging about freezer cooking, but I love to bake too! Christmas time is a wonderful time for baking and giving homemade gifts. 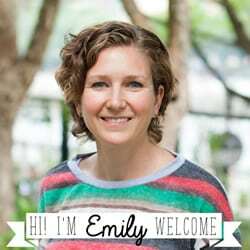 I’m delighted to be guest blogging for Emily at Nap-Time Creations. This bread makes for a wonderful family treat or a gift. It is moist and full of flavor. My husband does not care for cake-like dessert,s but he gave me a thumbs up on this one. Also, the recipe calls for semi-sweet chocolate, but I used dark chocolate chips and it tastes great! I think this will become a yearly tradition for us. If you are considering this as a hostess gift, I would buy a loaf pan at a gourmet food store or from a craft store. They usually have fun, seasonal colors. Just make sure your bread is completely cooled, place in a cellophane bag and tie neatly with pretty ribbon. * Read all the way through the recipe first, since there are a number of different steps. * Measure carefully which always goes for baking. * You may use an electric hand mixer instead of a stand mixer. Just be careful not to overbeat your mixture or your bread will be tough. *Leave plenty of time to make this. At least, 3 1/2 hours. 1) Preheat your oven to 350 degrees. Prepare your loaf pan by spraying with cooking spray and dusting with flour. Tap out the excess flour. 2) In a medium bowl, sift together the flour, salt, and baking powder. Set aside. 3) Using a microwave safe bowl, medium size if possible, heat the chocolate chips in 30 second increments, stirring in between until smooth. Set aside. 4) Using a stand mixer with paddle attachment; place the butter in the bowl, mix on low until smooth. Add the sugar and increase the speed to medium. Mix until pale and fluffy. Mix the eggs in; one at a time. On the lowest speed. Add the flour mixture in three batches alternating with the milk. Mix until just combined. 5) Add half of this mixture to the melted chocolate. Stir well. 6) Alternate between the chocolate batter and the plain batter, dropping by large spoonfuls into the loaf pan. 7) When the pan is full, run a knife back and forth making a swirling motion. 8) Bake until a toothpick inserted in the center come out clean; about 1 hour. 9) Let the bread cool completely; about 1 hour. 1) Put the remaining 3 ounces of chocolate in a bowl. 2) In a small saucepan, gently heat the heavy cream over low heat until just about to simmer. 3) Pour the cream over the chocolate and use a whisk to mix until smooth. 4) Let stand about 10 minutes to thicken slightly. 5) Pour over the bread and spread evenly with an off-set spatula. 6) Let stand for 1 hour. Store in airtight container for 2 days. This is bit more work than my usual recipes but it is such a great treat! Oh Yummy!!! Thanks for sharing Sarah!! !